I’m indebted to Don Meade who compiled this discography which was submitted to the IRTRAD-L newsgroup by Paul Keating with Don’s blessing. Don’s catalogue originally included Scottish harmonica players, but these have been omitted from this revised version which has been amended slightly to suit the IMR format. Any additions to Don’s text have been included in parentheses with the exception of asterisked entries which have been written and added by the IMR’s editor, sometimes based on submissions from readers (many thanks!). Like all discographies this is a work in progress, so any additions are always welcome – send them to discography @ irishmusicreview.com, removing the space before and after ‘@’ when you type in the address. The late Cape Breton Islander played Scots and Irish tunes on simple diatonic harmonicas. He used virtually no ornamentation and rarely played single notes. He had rock solid rhythm though, and his chords emulated the Cape Breton fiddle style of droning on open strings. Basker's duets 1960s with fiddler Johnny Wilmot appear on Silver Apple's Wilmot CD. Another Cape Breton harmonica player named Joe Burke appeared on the Topic LP The Music of Cape Breton, Volume 1: Gaelic Tradition in Cape Breton (1978). Joel, who lives in Seattle, performed with fiddler Randal Bays as The Rashers. His chromatic playing in the Eddie Clarke style is extraordinary and he also plays great diatonic harmonica, including solo-tuned (rather than standard "Richter-tuned") instruments. The Rashers tape can be ordered from Joel at 3635 Burke N., Seattle, WA 98103. The more recent Pigtown Fling (and his old-timey duet with fiddler Ruthie Dornfeld, Ways of the World) can be ordered from Foxglove via their website www.foxgloverecords.com. Sailing into Walpole's Marsh with Seán Corcoran, Maighread Ní Dhomhnaill and Maeve Donnelly (Green Linnet cassette CSIF 1004; 1983) – note the misprint of Eddie’s name on the cassette liner. James Conway is a Chicago musician who plays many instruments in many styles, but on this self-produced disc concentrates on Irish harmonica. He plays mostly diatonic instruments, with a few tracks on a D chromatic, all with good rhythm and solid Irish style. The disc also includes Conway's excellent tin whistle playing, guitar backing from Martin Hayes' partner Dennis Cahill and a cameo appearance from harmonica genius Howard Levy. The CD is available from his website: www.jamesconway.net. 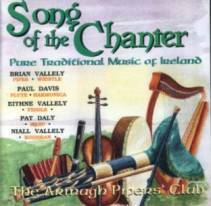 This 1970s recording featured members of the Armagh Pipers Club. 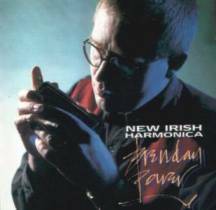 The late Paul Davis, an Englishman who played flute and concertina on the album, had one great track on harmonica, Father Kelly's Reel which he played on a C chromatic, using Murphy-style rolls. 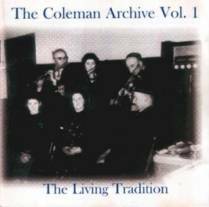 A Sligoman born in 1935 who learned his music from his father John, a fiddle player, Gerry recorded with the Coleman Country Céilí Band for RTÉ and can be heard on The Living Tradition, released in 2000 by the Coleman Archive. *Rick has also recently released Jiggin’ the Blues (G2CD7011) with Frankie Gavin and Tim Edey. Larry, a native of Enniscorthy, Co. Wexford, played reels, flings and hornpipes on a 10-hole Richter diatonic, using vamping chords and great ornamentation on this 1970s LP of San Francisco Irish musicians. Graham, another Seattle resident, played harmonica and clarinet in Open House, a now defunct band that also included the fiddler Kevin Burke. Graham plays chromatics in the Eddie Clarke style and is also a great diatonic player for Irish and "old-timey" American tunes. Larry, who played fine tongue-blocking chordal accompaniment, can be heard on tracks with Dan Sullivan's Shamrock Band and with singer Dinny "Jimmy" Doyle on this reissue collection of Victor 78 rpm recordings. Steve plays harmonica on one track on Celtic Thunder's first record, a great reel duet (The Woman of the House/Paddy Lynn's Delight") with flute player Linda Hickman. Andy, who uses Lee Oskar diatonics, mostly uses the harmonica in a shoulder rack to accompany his singing. He also plays some fine polkas on discs by Patrick Street, as well as jigs and hornpipes on his classic duet album with guitarist/singer Paul Brady (all Green Linnet). for $16 (US) from him at 61 Elizabeth Street, Aylmer, Quebec J9H 1E8. 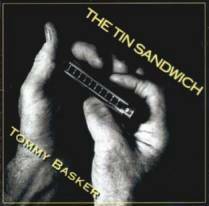 This LP includes a 1938 track from Wexford native Larry Kinsella, the first solo harmonica player to record Irish music. It's a superb rendering of the hornpipes The Showman's Fancy and Pretty Maggie Morrissey. Mick, a Dubliner with Wexford roots, is a superb all-around harmonica player who has mastered traditional blues style, Howard Levy-style overblows, jazz improvisation and the Eddie Clarke approach to Irish music on the chromatic harmonica. Mick often uses an instrument with reed plates in B and C to play in any key, a truly chromatic approach that mirrors that of B/C button accordionists. 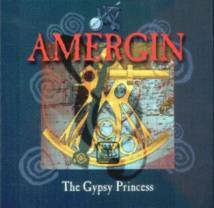 His solo recording includes traditional Irish tunes as well as original melodies, jazz, blues and Balkan music. He also appears as a guest artist on recordings by Altan, Niamh Parsons and others. His disc can be purchased from Claddagh's website – www.claddaghrecords.com. An Antrim native who plays a tremolo diatonic instrument, Kieran manages the neat trick of playing on one reed plate by covering the other with his lip, then switching to double-reed tremolo sound for a fuller effect, much like a button accordionist switching couplers. He relies on trumpet-style tongued triplets for ornamentation. New York chromatic player Don Meade plays one solo and one duet track on Wexford button accordionist and fiddler Tom Dunne's independently issued CD. 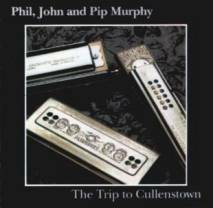 The late Phil Murphy and his sons John and Philip ("Pip") from Bannow, County Wexford formed a celebrated Irish mouth organ trio in the 1970s and 1980s. The Murphys play mostly Chinese-made tremolo diatonics. They favour relaxed tempos, use great chordal accompaniment and play well-thought-out arrangements with very cleanly executed ornaments. Their rhythm is absolutely rock solid. The Murphys can also be heard on some tracks of the fiddler Kevin Burke's Up Close (Green Linnet) and on a locally distributed 1980s cassette, Traditional Music from South Wexford. 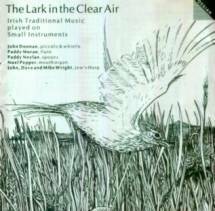 The Lark in the Clear Air (Ossian OSS CD 13; 1993 CD reissue of original 1974 Topic LP). Pepper, a Corkman living in England, played diatonics with a huff-and-puff style on several cuts of this compilation of "music on small instruments." 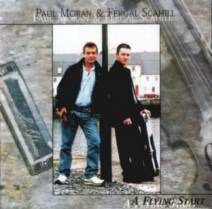 He soloed on slow airs and played dance tunes with flute-player Paddy Moran. A New Zealander who moved to London, Brendan plays both diatonic and chromatic harmonicas for blues, Irish and other music. Some tracks on his record are very traditional, with Murphy-style ornaments. Others feature modern interpretations of Irish tunes in American country style. Power is much in demand as a session player and his bluesy riffs can be heard on River of Sound, Arcady's Many Happy Returns, Altan's Blackwater and other discs. He has other solo discs, including one featuring music from Riverdance and his latest release, Tradish. Recorded with vocalist Denis O’Donovan, according to the person submitting this entry “The singing is pretty dodgy and the piano accompaniment to the dance tunes is...erm...'not so traditional' but the harp playing is pretty good.” I have not yet been able to track down any biographical references to Reilly, but recall him being a mainstay of the UK variety scene in the 1950s and 1960s, often appearing on the radio and television. The only CD of his listed in the Music Master catalogue dates from 1988 and is called Thanks for the Memory which used to be the title of a regular show on the BBC’s Light Programme (nowadays known as Radio 2). 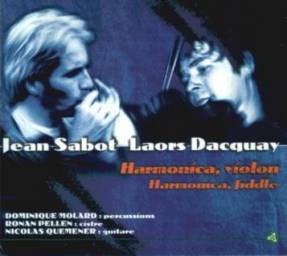 Jean Sabot is a Breton musician who plays a variety of harmonicas, seemingly both diatonic and chromatic, including some which have almost certainly had their tuning adapted, such as one in B minor 7th and another in E minor. He’s joined on this album by the fiddler Laors Dacquay, with accompaniment provided by percussionist Dominique Molard, Ronan Pellen on cittern and the former Arcady guitarist Nicolas Quemener. Its fifteen tracks include a number of Irish tunes, including an intriguing combination of three jigs, sourced from John J. Kimmel, The Flanagan Brothers and Joe Derrane. Jean has also included a number of his own tunes and obviously has an eclectic ear as others originate from Cape Breton and the Tynesider James Hill as well as his native Brittany. Jean plays with a very rich tone and incorporates numerous twists and turns in his music and, like the great duo of Joe Ryan and the late Eddie Clarke, there are times when it is impossible to separate the harp from the fiddle. Hugely enjoyable throughout, this is an album well worth tracking down (and many thanks to Jean for sending me a copy). His label’s email address is coopbreizh@wanadoo.fr. Steve is an Englishman, living in Cornwall, who plays traditional music on mainly 10-hole single-reeded diatonic harmonicas. His preferences are the low D Special 20 (keyed in D) or a Lee Oskar (in G). 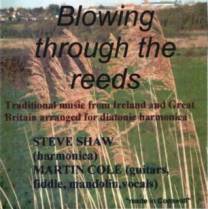 Steve also ‘retunes the 2-draw reed up by a tone so that he is able to play the missing 6th note in the lowest octave’ (as the liner notes state). On his debut album he also plays one track on a double-sided Echo keyed in D and A which involves frequent flips and he also regularly switches positions during the playing of a tune. Blowing Through the Reeds features predominantly Irish tunes, as well as a couple of Scottish reels and a hornpipe and reel from Northumberland. He is accompanied by Martin Cole on guitars, mandolin and fiddle. Click here to see a review of Steve’s album. Steve’s website is mysite.wanadoo-members.co.uk/trad_irish_harmonica and, currently, his album is only available from him directly. James was born in Wallace, Nova Scotia and brought up in Windsor, Ontario. His father (from Cape Breton) played the harmonica and was a major influence on James learning the instrument while his mother (from Prince Edward Island) played the piano and had a repertoire of fiddle tunes. Though he’s played many forms of music James keeps returning to the diatonic ten-hole harmonica and Irish, Scottish and old-time tunes. Click on the link above to see a review of his debut album. Mat hails from Stoke-on-Trent in England and this intriguing album sees him double-tracking its title’s instruments. The harmonicas are neatly displayed on the cover too! The link above will supply a review of his album. His 2006 album Cold in April (KLATE CD 008) also features harmonica on some tracks.